The smell of love is in the air as Valentine’s day quickly approaches! We are ready to have you outfitted with the cutest quotes, art, and apparel ideas. These work as gifts for him too, or yourself! This holiday has roman festival origins which comes I’m sure as no surprise to most. They were an amorous group and loved the idea of romance and Gods and Goddesses and even hedonistic parties and rituals. A Pope eventually renamed it from the roman festival Lupercalia, which was a strange love fest celebrating spring and fertility and the sacrifice of goats and a dog, to Saint Valentine’s Day. Valentine was believed to originate from two tales of two different men doing love deeds, like marrying off couples and curing a jailors daughter of blindness. It was later believed that it’s possible all the stories were about one single man. Formal cards or messages otherwise known as Valentines appeared in the 1500’s, and the tradition has grown over time. Now celebrated over various parts of the world, a gift of love on February 14th is now widely accepted. We know that this is also a time to remember loved ones from the past, those that might no longer be with us, and that more marriages are performed on this day and marriage proposals than any other date. We also many a times have sought out a person to share the day with, and not always a lover. Sometimes good friends get together and celebrate being single, sometimes we want to hold a séance and try to cross the veil and lament a lost love, and sometimes we just want to be full of impish tricks and mirth like the God Cupid. Without further ado, we present the Love Never Dies collection.Be sure to use the coupon code VDAY20 to get 20% off of these items (valid until 2-17-2019). 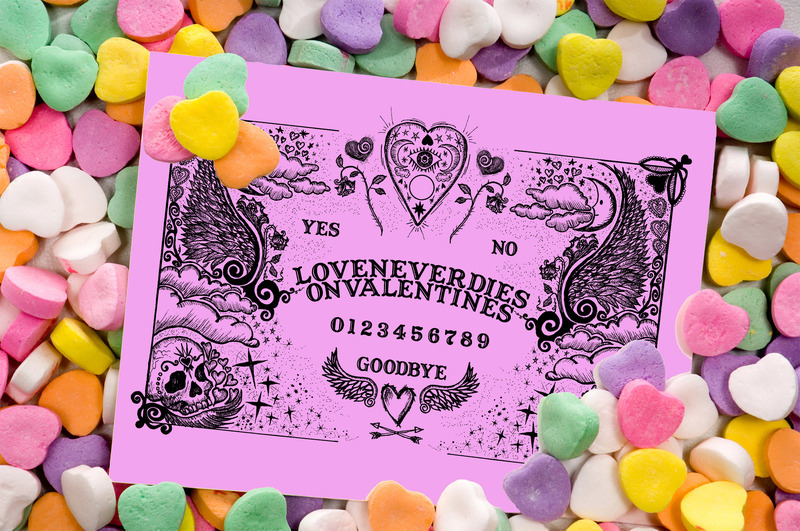 Inspired by our love of the occult and the Ouija board, this is the perfect thing for our less than frou-frou crowd. Mystical, edgy, and spiritual; this hand drawn design has been brought to life digitally to help seek out your fellow cosmic kindred peoples. Want to wear you heart on your sleeve and let everyone know where your head is at? You can with the Love me set. Featuring bold graphic hearts and font, people will know exactly what’s up. Comes in a rainbow variety as well as red, so you can find your perfect person, and they can find you! In the mood for going out on the town and making dreams come true, breaking some hearts, and being a love taker? You can give fair warning in this Heartbreaker set. Lastly, feeling single and ready to mingle? Just want to link up with some friends and enjoy being single, celebrating your independence and freedom with other alphas who don’t need no man or otherwise? Check out our Single Celebration shirt set. Comes in two varieties so that no matter what you’re into, you can get the word out! Valentine’s comes once a year, make sure you get these limited edition pieces!